Earn up to 1,592 reward points. Two legendary fuzz sounds in one space-saving pedal guaranteed to blow your mind. 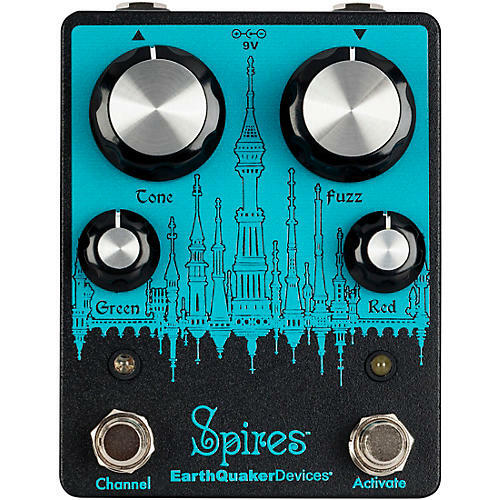 The Spires was born from EarthQuaker's need to have a big old Rosac Nu Fuzz and their now discontinued Dream Crusher on a pedalboard without taking up all the space. The green channel features a cranked fuzz inspired by the Rosac Electronic Nu-Fuzz, which, for all the unacquainted fuzz seekers, was released in 1968—decades prior to the dreaded “nü” prefix ever being uttered. The original schematic for Rosac Nu Fuzz is somewhat of a mystery so I used my original to make a “sonic copy” that is pretty much dead on. It is full-on fuzz all the time and uses crude wide range tone control to change the character from big and warm to sizzling and blown out. The original was slightly below unity at max so I gave this one plenty of output volume while retaining the original tone. The Red channel is a silicon version of the now discontinued Dream Crusher. There's no need to mourn the loss anymore. Dreams will still be crushed with walls of classic two transistor fuzz, only this time the crushing will be much more stable and less temperature sensitive. It features a very usable, dynamic Fuzz control and tons of output volume, just like the original. Each Spires is hand made one at a time by a white gloved team of professional experts in the dirty, dusty canyon of Akron, Ohio.